There’s a bit too much wood on this piece, so I’m setting up to hew an inch from what will become the bottom of the beam. “Getting my bearings” with those gouge marks as a guide. There’s also a bit of “frass” to be removed, where bugs and bacteria have been working on the sapwood. Immanuel Kant said that what we have to work with is the “crooked timber of humanity”. I’ve been dealing with some of that too, but lately it’s been more of the real thing. 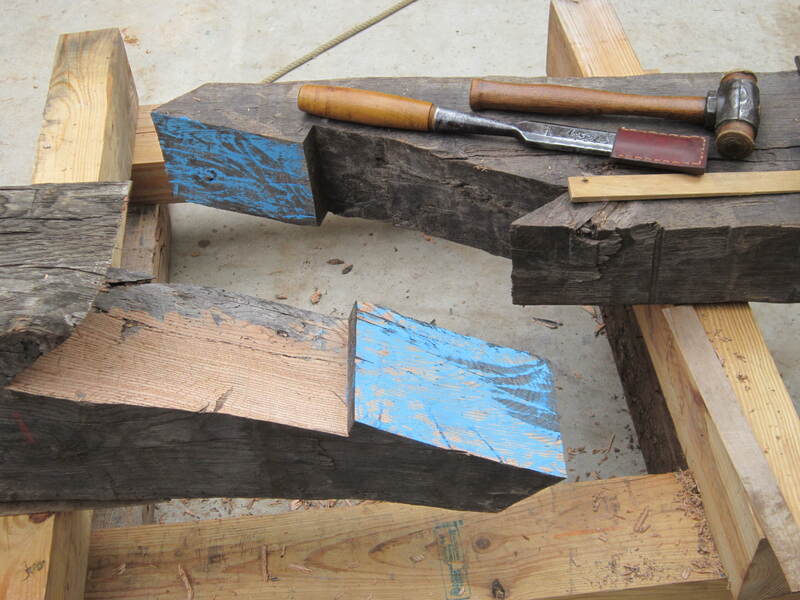 Some things just take a long time to realize, and this pile of timbers collected over the years is becoming a frame. 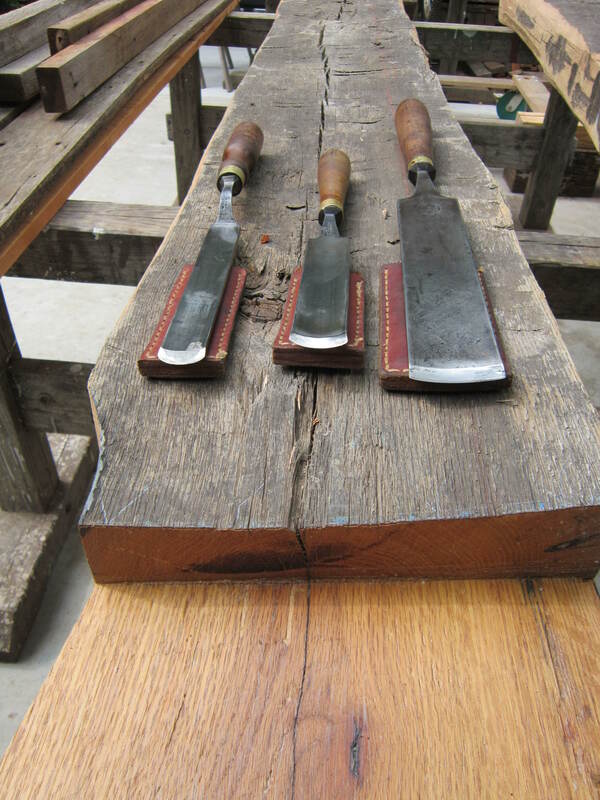 Most carpenters work with lumber that can be bent or twisted into plane, and square off the edge of the board, cabinetmakers plane every piece flat and square, imposing an external geometry. 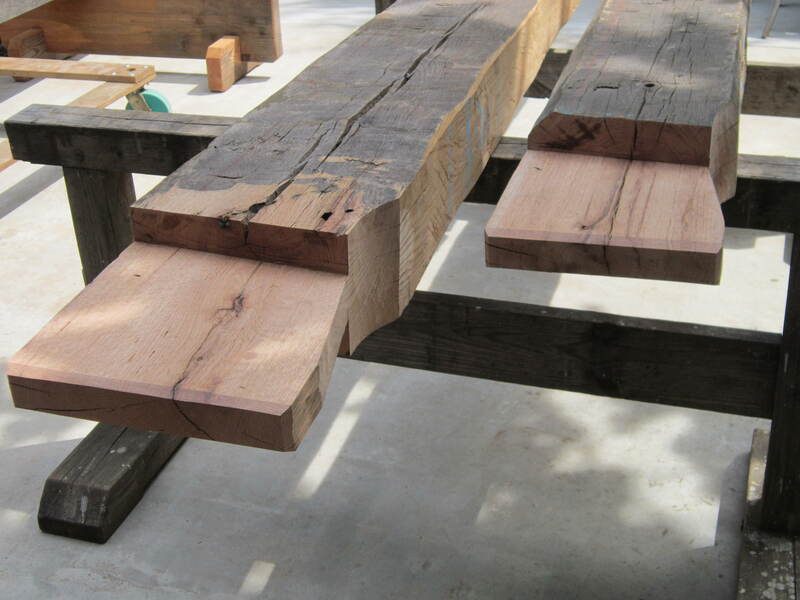 Timber, unless you are going to have it sized and squared mechanically, requires a different set of solutions. 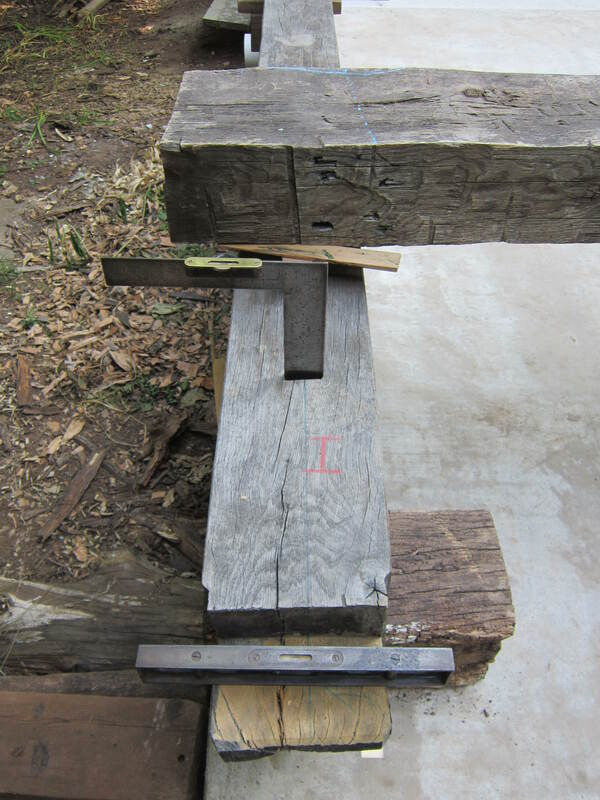 To begin with, some oak 8×8’s that were procured to teach a class in square-rule joinery (hang a framing square on each end, sight them into alignment, transfer centerlines and proceed) about eight years ago, then left lying about until they were severely bowed and twisted. No way the joinery would fit up, I planed the beam tenons and epoxied cheek pieces, re-established the layout and re-cut tenons. 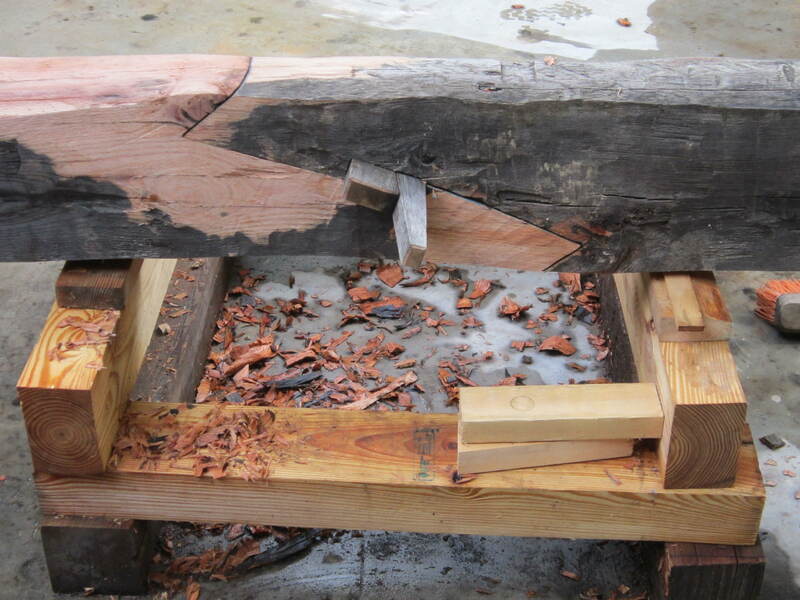 The posts were all re-oriented to the mortice, and the top tenon leveled for reference. 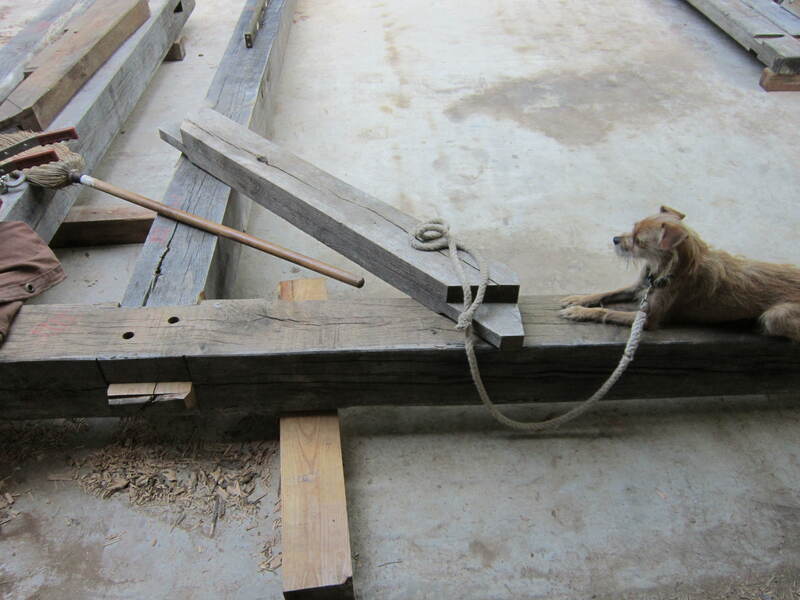 The “establishment” one beam laid over the other, both referenced to a layout on the floor, transferred by plumb-line and dividers. 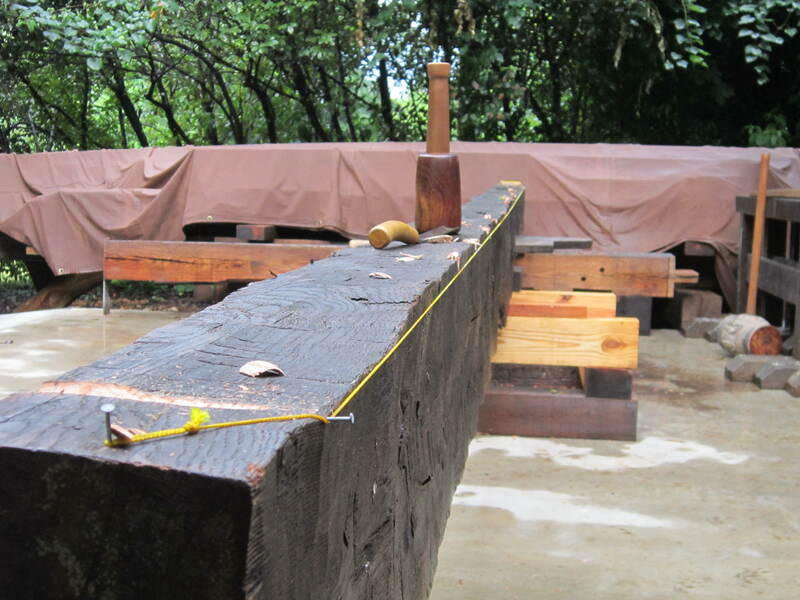 The little level on the square, and the small level on the tenon indicate layout plane. 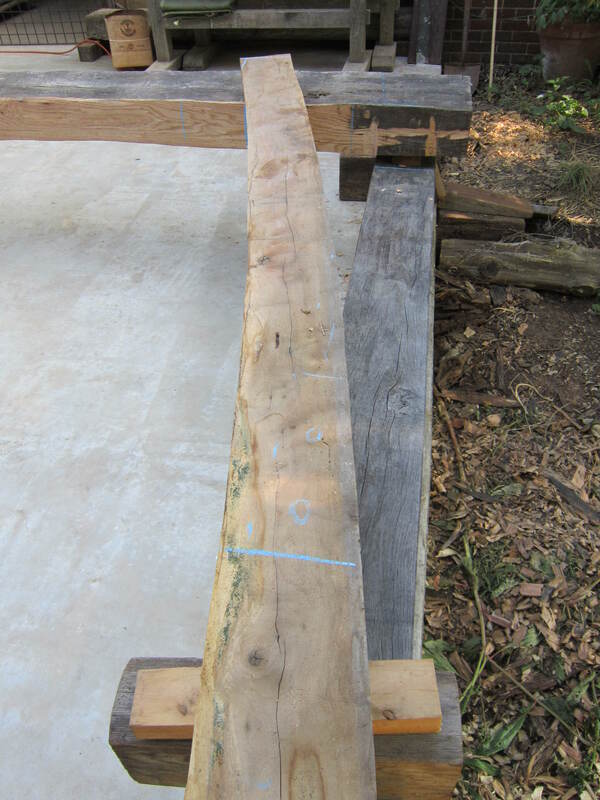 Next the main beam, or rather two beams scarf-jointed to become one eighteen-foot long hand-hewn 6×12 piece of red oak. Thanks to Matthew Ross for this piece. That done, on to French-scribing the joints. The essential tools for scribe layout. 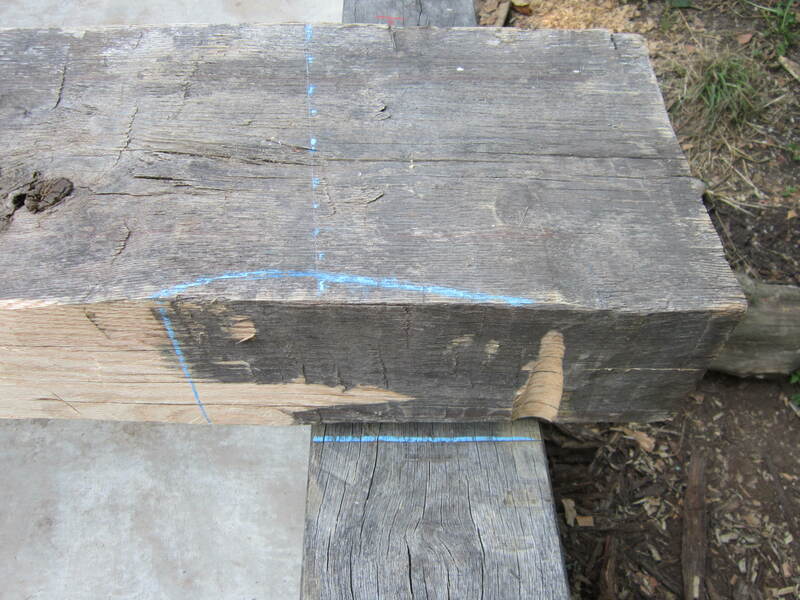 I was taught by a French journeyman carpenter to leave the timber faces as they come, and transfer marks as relative to the plumb line (thus shoulders and meeting surfaces would have to be compensated or cut out 0f square). 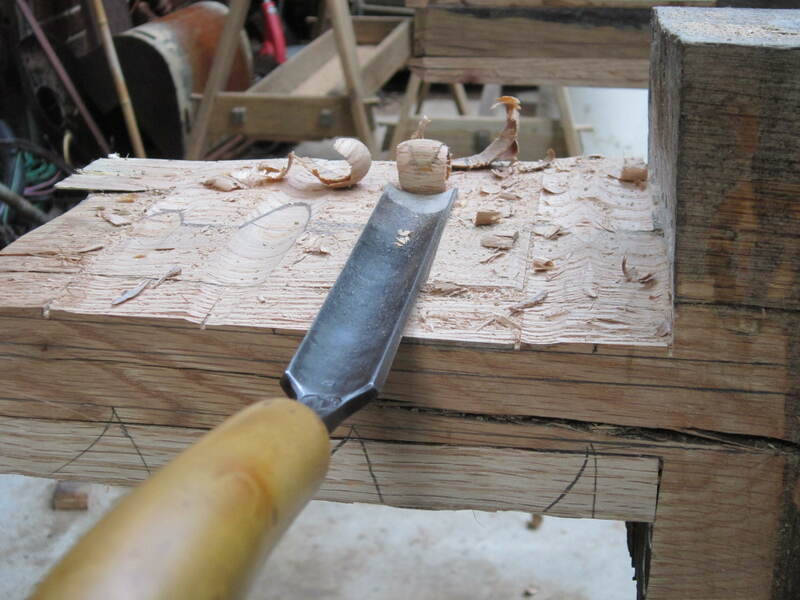 Over time, I have found it easier to carve bearings across the plumb faces of the timbers with a shallow out-cannel gouge, and bring the timbers into square at the critical points of intersection. The gouge on the right is a 2″ D R Barton that was the first one I acquired. I use it to reduce the waste on tenons. 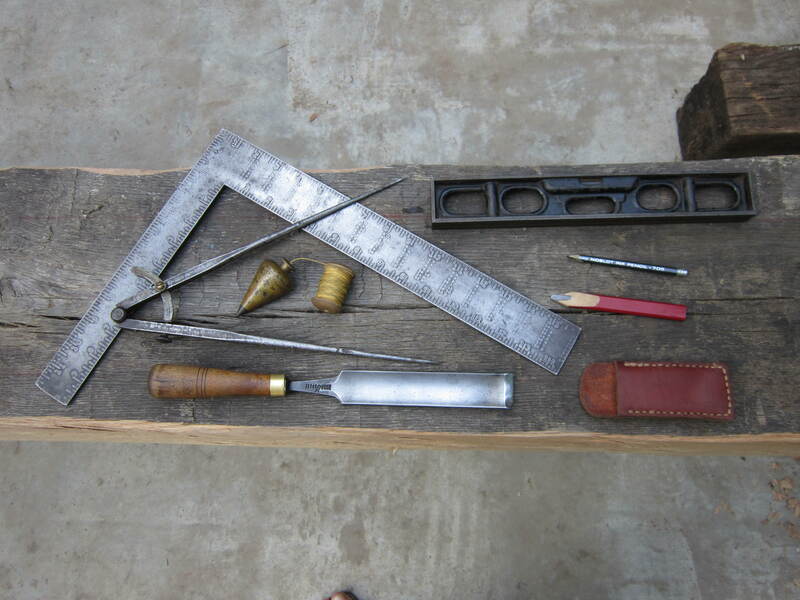 On the left is a Marples pattern-maker’s cranked out-cannel gouge, sharpened to a bull-nose profile. The great advantage is that it can be easily sharpened with flat stones, no need for a slip-stone. In the middle is a 1 ¼” Buck Brothers that has a very gentle sweep along it’s length. Useful for cleaning up hollow places torn out by over-enthusiastic hewing, erasing/correcting layout marks, a truly elegant tool. I use the typical array of mallet and framing chisels, rabbet plane, and a few hand-made hollowing planes, but the gouges enhance my ability to produce clean, accurate joinery in a reasonable amount of time.